I just found a great blog called “Devine Detours”. The blogger, Kathy Harris, interviews both musicians as well as authors. Drop by and post a comment after my interview to be entered in a drawing for a free signed copy of An Amish Family Reunion. By the time I’m done anyone who wants a free book might just have one! right now the sun is shining and it’s warmed up to forty degrees. if this is winter, I’ll take it! enjoy this unseasonably break in our normal winter. Today I’m interviewing a non-fiction writer who penned an amazing book titled: SubMission by Zeke Lam. This photo is of him with some children in the Dominican Republic. I asked Zeke some questions to get a feel for his book. 1. Give us a blurb of your latest release SubMission: SUBMISSION focuses on the dire need for the body of Christ to operate daily with Biblical obedience. In other words, we willfully obey His voice and leading in our lives to the extent that we are willing to abandon any and all idols that separate us from the level of submission He expects from His children. In an era where compromise seems so typical, living a life surrendered fully to the Lord appears quite challenging. SUBMISSION hopes to capture the simplicity of absolute surrender to the voice of God. 2. What do you hope readers will take away from reading this book? My prayer is that each reader will walk away with the desire to submit every area of their lives to Jesus. Often times in the Christian faith, people have a tendency to plateau. I have been guilty of this, and found it to be due to the fact that there were areas in which I refused to let go. Hopefully upon reading this book, brothers and sisters worldwide will surrender like never before and position themselves for revival and spiritual greatness. 3. How did your personal faith grow/change during the writing? My faith was challenged in multiple ways. Perhaps the most convicting was the fact that the level of submission I wrote about must be present in my everyday walk. As I wrote, areas became exposed where I had failed to submit. Penning these words ignited my heart to daily walk and live a life of total submission to the voice and commands of Jesus Christ. 4. What do you see as the greatest challenge facing Christians during the twenty-first century? The greatest challenge is compromise. We take the word of God, mix it with a little bit of man and call it obedience. This cannot continue to happen if we expect to see the Holy Spirit work the way He is capable of working. In short, this can be simplified down to the word idolatry. Christians around the globe must identify the areas of our lives which hinder God’s presence and remove them. 5. What are you working on now? In relation to writing, I am working and praying hard to spread the word about SUBMISSION. In addition to this, I am preparing to begin working on the next book in the submission series. Here’s a little about the author: ZEKE LAM is the founder of SUBMISSION Ministries—a ministry devoted to seeing lost souls encounter God and live lives fully surrendered to the risen Christ. A graduate of Liberty University, Zeke’s deep passion for following Christ’s will has led him through many years of youth ministry and itinerant evangelism. Both of these experiences have enriched and fueled his desire to hand others the keys to a Christ-centered life. Zeke resides in Virginia with his beautiful wife, Kathleen, and a growing family of future world-changers. Everyone have a great week. The sun is shining in Ohio, so you know that makes me happy indeed! Blessings! Happy New Year everyone, and I hope you’re enjoying winter wherever you live! 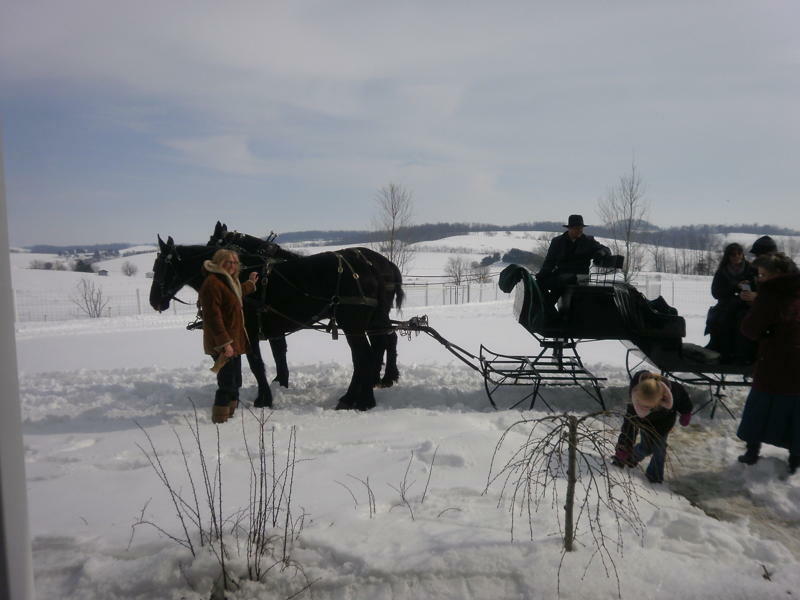 Here’s a photo I took down in Holmes County during an Amish farm sleighride. What fun that was with plenty of hot cocoa and cookies at the end of the ride. Although we haven’t had anywhere near as much snow so far this year as last when this photo was taken. And frankly, that’s okay with this big freeze-baby!! Two reminders…don’t forget to drop by my new website and sign up for my (future) newsletter. You’ll be entered in a drawing for one of five free copies of An Amish Family Reunion. OR leave me a comment here on my blog. Either way, I will enter you in the drawing. And for those of you who Facebook, drop by AmishReader.com’s facebook page. They’re also running a drawing to win one of five free copies of Reunion. Good luck to everyone! And happy winter!